In last week’s piece, I expressed concerns over the high pressure rate allowed. How did they do this week against the Kansas City Chiefs? 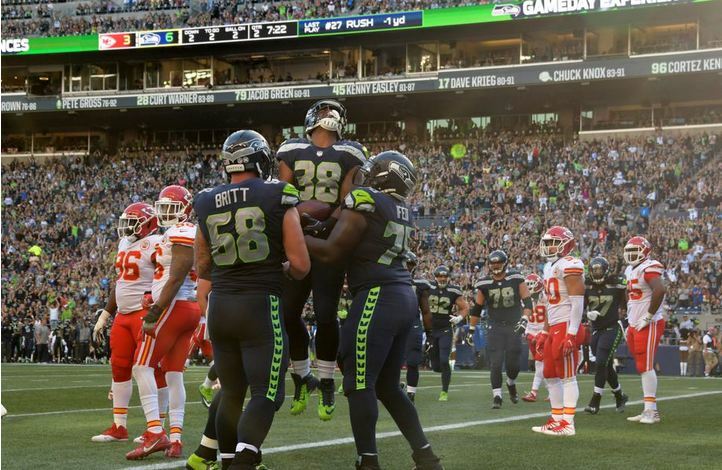 Below are the 27 Russell Wilson dropbacks of Seattle’s preseason game against the Chiefs shown at 80% speed. Play numbers can be found in upper right. Notes from each play are below. In addition to general notes, I will pay special attention to RT. After each pressure, I will give the number of pressures we’ve seen to that point and assign primary blame. For example, (2: Oday Aboushi) on play 7 below means it’s the 2nd pressure given up in the game and it was primarily due to Aboushi. It looks like starters for 4 of the 5 positions on the line are set. The remaining open competition is at right guard, where Aboushi was in for plays 1-7 and 21-27 and Mark Glowinski for plays 8-20. Defender instantly splits Britt/Luke Joeckel but gets fooled by the play action and chases Chris Carson. It is somewhat difficult to say whether some of these plays should count as a pressure due to Wilson’s mobility, but by my count, I total 5 pressures in 27 dropbacks, or 18.5%. This is a substantial improvement from Week 2 against the Vikings, where I calculated a 44% pressure rate. But regardless of the exact number, things do appear to be trending in the right direction. Odhiambo held up just fine in his starting debut at left tackle, and my concerns about Ifedi at right tackle have been somewhat assuaged. While this is all good news, there are a couple caveats to keep in mind. As I noted on twitter, the Chiefs were not particularly good at applying pressure to QBs last year, and they were playing without by far their best pass rusher in Justin Houston. They also seemed to be more vanilla in their pass rushing schemes than the Vikings were in Week 2. Caveats aside, it is better for the line to look good than bad at this stage in the preseason. Having 4 out of 5 starters settled is also encouraging. We will see whether the OL improvement is real or a mirage when they try to block Nick Perry and Clay Matthews to open the season on September 10 in Green Bay. This entry was posted in Seahawks Football 2017 and tagged Seahawks Football play. Bookmark the permalink. Seahawks Football - This site is not affiliated with NFL.com's NFL Game Pass.